Canadians, Become a BzzAgent and You Could Win $500! I have been a BzzAgent for almost a year and I think it's a great opportunity to help spread the buzz about amazing products and worthwhile causes. 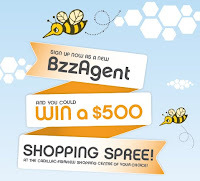 They are currently running a contest where anyone who joins BzzAgent could earn a $500 shopping spree to the Cadillac-Fairview Shopping Centre of their choosing. Wouldn't that come in handy? And since I'm not eligible to win, I'm passing along the information to you. All you need to do is register as a BzzAgent by visiting bzzagent.com/go/canada and you'll be entered upon registering. Even if you don't get the shopping spree, you still get all the benefits of being a BzzAgent. Contest ends October 31, 2010.